Benefit every Sunday with BOGOF Bingo! How does the chance to get a free £5 bingo bonus EVERY Sunday sound? Well, thanks to BOGOF Bingo, that can happen to all their players thanks to their amazing Super Sunday offer! How to qualify for this amazing offer! To qualify, all you have to do is stake £20 on bingo on any given Sunday and you’ll immediately be credited with a free £5 bingo bonus. Use this to use play bingo in any way you desire. Whether you’re crazy for 75-ball bingo, or nutty for 90-ball bingo, once you’ve played through £20 you’ll instantly be credited with a £5 free bonus. So, sit back, relax, grab a cup of tea and enjoy the game as the numbers are called out. If it turns out not to be your night, you can rest a little easier with your free bonus coming along. However, if you get lucky, how sweet will it be knowing that as well as your winnings, you can add a nice bonus into your account too. The rules and regulations that come with the bonus is that you’ll have to play through the bonus five times, and that it must be spent within two weeks of receiving the bonus – but we’re sure that shouldn’t be a problem for all the bingo fanatics out there! As is normally the case, only one bonus is available is per person, household address, email address and credit card number – no cheating then! The great thing too is that BOGOF have not restricted this offer to certain weeks. 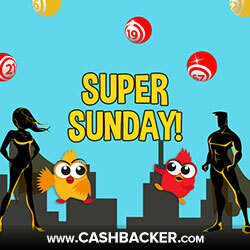 Simply log in and play on any Sunday to capitalise on their generosity. Hopefully you’ll earn yourself a nice little bonus in the process – now that would be nice. Overall, it’s a great way for bingo players to get that little bit more out of their Sunday fun. To be honest, what else would be you be doing? Grab your dabbers and enjoy a bit of weekend bingo action!